New Print, Pattern and Colors!!! Thanks to Erica for sharing this picture of her new Boogie shorts. I bet you the floral like blotchy print on the left (which I LOVE) is that Multi Green Fancy Love Print we’ve been hearing about. 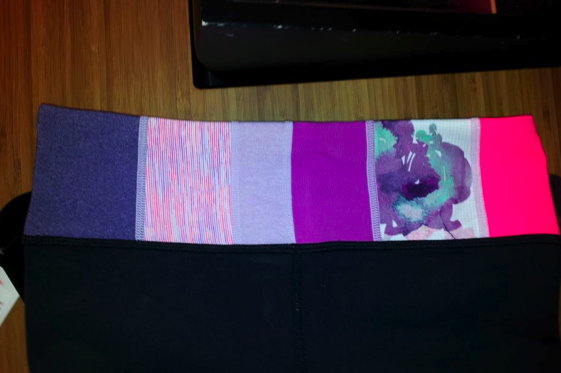 There is also a space dye print that looks different from the Ultraviolet Dazzle Space Print we’ve seen pictures of. THis one looks a lot more white. I think the blue on the left is a heathered indigo, then there is a Lavender Dusk, Ultraviolet and the color on the right looks similar to Passion but maybe it’s a Dazzle..
"New! Dazzle We are From Space Print Speed Shorts"